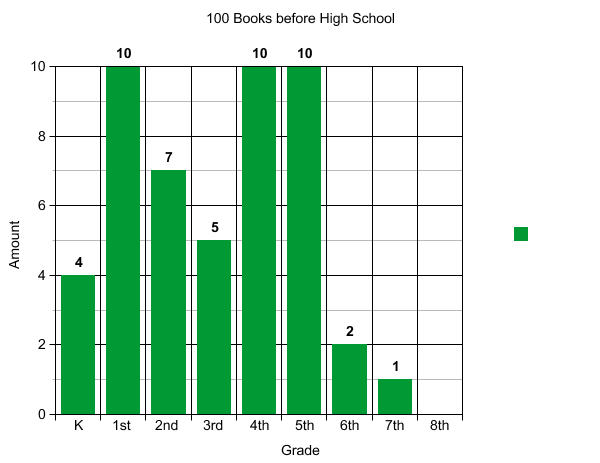 We also just launched 100 Books before High School, to which many of you showed interest. This passive reading program is for grades Kindergarten-8th grade. Every book that is read independently will be recorded on their log sheet. Every 10 books, they review their favorite book and every 20 books they come to the library and may choose one free book. We also have a race track banner wrapped around our J Fiction (3rd-8th grade) section where their individual car advances along the track every 20 books they read. They may potentially receive 5 books by the end of the program, and, upon completion, their photograph is added to the finish line. I can already hear your scientific minds rattling, piecing out the weak points (which is what makes us so powerful). How in the world does a Kindergartener read independently? Well, it isn’t a blood pact so we anticipate wiggle room, especially with grades K-2. The purpose of the program is to build reading habits and encourage visits to the library. If an adult sits with a 5-8 year old and helps them through a book, taking time to encourage reading, and providing a physical reward at the end (the reward of visually seeing their completion and being closer to their own free book) then by all means. We’ve done it! And guess what the reward is? More reading! 100 books may be daunting! That’s why every 20 books, a child receives a free book. They don’t necessarily have to read 100 to get the free book (but they can to receive FIVE free books and photo recognition) so they can set a goal for themselves. How do you provide 5 books per child for only one program? First off, this is only for Fremont patrons as it is a financial investment. We use the Scholastic FACE program whose sole purpose is to provide libraries/educational institutions with 50-75% discounted books that will then be given to children for free. Fremont Library’s situation is also unique. As an Illinois library serving a medium-sized population with only one building (and no bookmobile) programs such as this can be easy to fund. We are also using the Illinois Per Capita grant. Typically, this is used for materials but this year we were able to pitch it as a literacy grant that could be used for programs such as 100 Books before High School. Although we do not, you could keep on hand lightly used discarded books or donations. The program itself is very easy to implement, although a significant amount of staff time is required for setting it up (while I focused on 1000 Books, a coworker focused on 100 books). Staff training was pretty simple, provided you have an Instruction sheet for librarians to read over when they sign kids up. Upkeep involves the creation of new log sheets and moving the cars along the posters as kids advance down the track. Tips for signing kids up? One weekend shift, I must have signed up 20 children to this program. Whenever someone would approach my coworker for a reference question or reader’s advisory, I would pounce while she was looking the material up on our catalog. This is a great way to sign kids up that are already interested in reading or are seeking the library out for books that they must read for school. After two weeks, we have 50 children signed up! Below is the division of ages. Questions, comments, and the like are more than welcome. Please let me know what you all think! THAT’S SO AMAZING. I normally don’t use all caps, but I really think that the 100 books thing is spot on. I may have to steal the idea for my library. Is that cool with you? Great job, Kelsey! Highest of fives! What wonderful ideas! I would love to propose this to our small town library as we need new programs to bring families back to our little library.